In the spring, with so many players in the lineup everyday, it is difficult to learn anything about playing time from the boxscores and statlines. What we really need to know is how much playing time each player gets at each position, and more importantly, when are they in the game at various positions. There is a big difference between playing the first five innings against the Yankees, and playing the final 2 innings against the Reds. In the former scenario, the opposing team is more likely to feature a lineup with everyday major leaguers. So we broke down the playing time by position. Afterward, we split the playing time up in to the first 5 innings of each game and playing time in the last 4 innings. Admittedly, this is a somewhat arbitrary grouping. But glancing at boxscores, it seems that the sixth inning is the most common time for managers to take out their starters. 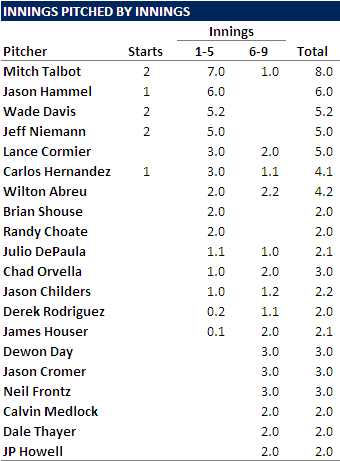 After the table of position players, we also took a look at the pitchers. We asked the same question: Who is pitching in the most challenging innings of spring games? Again, pitching the ninth inning of a spring game may mean little compared to pitching the third inning, even for a reliever who is more likely to face better hitters early in the game. This does not necessarily tell us how each player is performing under the different scenarios, but it does give us a sense of what Maddon and pitching coach Jim Hickey think of each player, who they think can contribute at the major league level this season and which players they want to get a good long look at. We will update this list every few days and we will see how the playing time changes over the next month. At this point it is still a little early to make any generalizations, so we will save comment for the time being.